Dawn attended the University of Georgia, receiving a BFA in Ceramics and a Minor In Latin 1999. Shortly thereafter, she moved to Atlanta to become Co-Director of Ballroom Studios Alternative Art Space and a resident artist at Callanwolde Fine Arts Center. In 2002, Dawn received a grant from Fulton County Arts Council, which funded a residency at The Hambidge Center for Creative Arts and Sciences. The following year, she became the Founding Director of The Hambidge Center’s Ceramics Program. 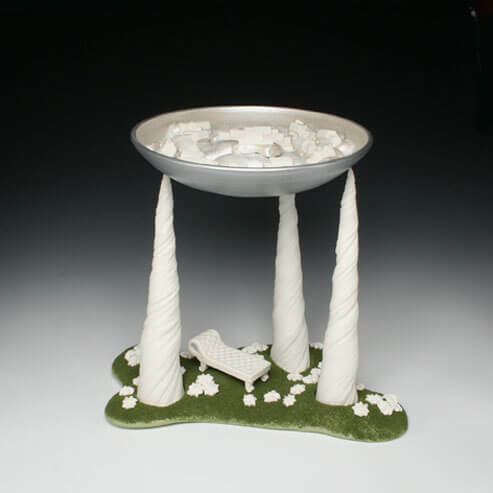 Dawn recently earned her MFA in Ceramics at The Rhode Island School of Design. Some walls are transparent and fluid, like the walls of memory. The malleability of memories is evident in the way their details ebb and flow over time. Certain words or sounds or smells surprise in their ability to conjure up long-forgotten moments with striking clarity, while the details of other moments, even dear or favorite ones, fade slowly over time and are never regained. How can we reconcile the desire to hold on to the past and the notion that “this very moment” is all we can reliably know? How do the binding and irrevocable occurrences of the past, of childhood shape us as we go forward? Intermingled with our memory, bound inextricable in mind, blossoms the world of fantasy and dream. So seamlessly, so effortless does nostalgia shift to daydreaming we hardly notice the divergence. What does a child dream of? Children try out the roles we have shown them; they practice grown-up life playing house. What does the adult dream of? The relief and innocence of childhood ignorance, perhaps, and all of the things not yet been obtained. As the child slips into adulthood, do the dreams of youth become precious or laughable? As adults, can we honestly admit how quickly the innocence of childhood dissolves? Fantasy gives us the means both to escape reality and the motivation to move forward; it provides respite and hope. Fantasy offers form to our conscious and unconscious desires. The act of noticing gives us the opportunity to interface with the existing moment, heightening our awareness and sense of presence. Shifting between states of attentiveness and imagination provides the opportunity either to acknowledge the rift between the inner and outer worlds, or to ignore it completely. These different states of being are like a mobius strip, a one-sided loop that twists back upon itself. In my work I seek to unfurl the connections between childhood memory and adult fantasy; the emergence of sexuality and the loss of innocence; longing and owning; the rift between past and present; dream and reality; comfort and discomfort. I offer a state of confusion about what is real and what is imagined, what is large and what is small, what is child and what is adult. I hope to engage the viewer by providing objects to notice, imagined spaces in which to fantasize, and narrative images into which the viewer may tentatively step. The house is a reoccurring emblem in my current sculpture (Settling In or Daydream Terrain of the Surveyor), installation (Play House), and video (Suburban Allegory) work because it is the stage upon which all of these struggles and transformations are played out. The house is at times a souvenir, an object of longing or of power. To the fantasy princess of Suburban Allegory, tiny model houses take on a fetishistic quality as she alternates between placing them carefully near beautiful homes and franticly gathering them under her dress. Her presence is both surprising and lonely, as she searches alone for the perfect home and watches the sand fall quickly through the hourglass. Play House provides a fantasy space that can be entered by the viewer, a decadent and saccharinely beautiful refuge, safe and cozy. Yet, the indulgent and childish fancifulness of the space is undermined by tiny porcelain houses scattered on the floor, which prick the viewer upon entering. These pieces work together both to form a monologue of the domestic interior, and to explore the many variations of meaning present in the notion of the “dream home”.